In July 2018, the official Kurt Schwitters Society UK published in its Newsletter the following interview with artist Michael St.Mark on the possibility of returning Schwitters’ Merz Wall from the Hatton Gallery in Newcastle – where it has been on view since the 1960s – back to its place of origin and obvious intended exhibition status as integral to the Merz Barn in Elterwater, Great Langdale. Editor, scholar and recognized KS authority Gwendolen Webster raises some thorny issues and poses questions surrounding both the practicality and artistic merit of such a future move. 100 years since the end of WW1 and the Armistice of November 1918. High time surely to re-design the traditional poppy to add a long-overdue reminder to our politicians to never again allow an unjustified war such as the Iraq debacle, that was essentially based on oil prospects rather than national defence. 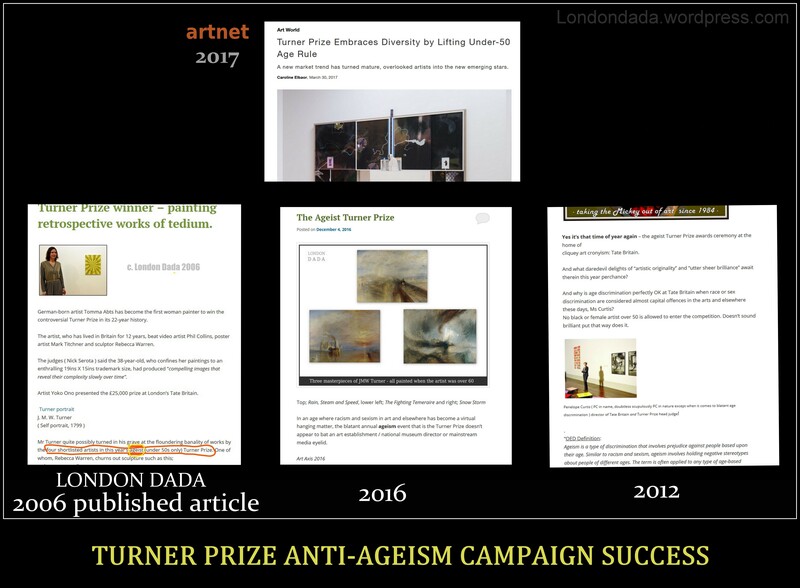 Turner Prize chiefs finally shamed into removing the anachronistic and blatantly ageist Under-50 rule for shortlisted entrants. Did any other artists have the moral backbone to put their careers at risk by daring to criticize the TP directors over this? Re-visited Work No. 631 from 2012; this longstanding shameful national phenomenon is again highlighted in a damning new report (see link below). 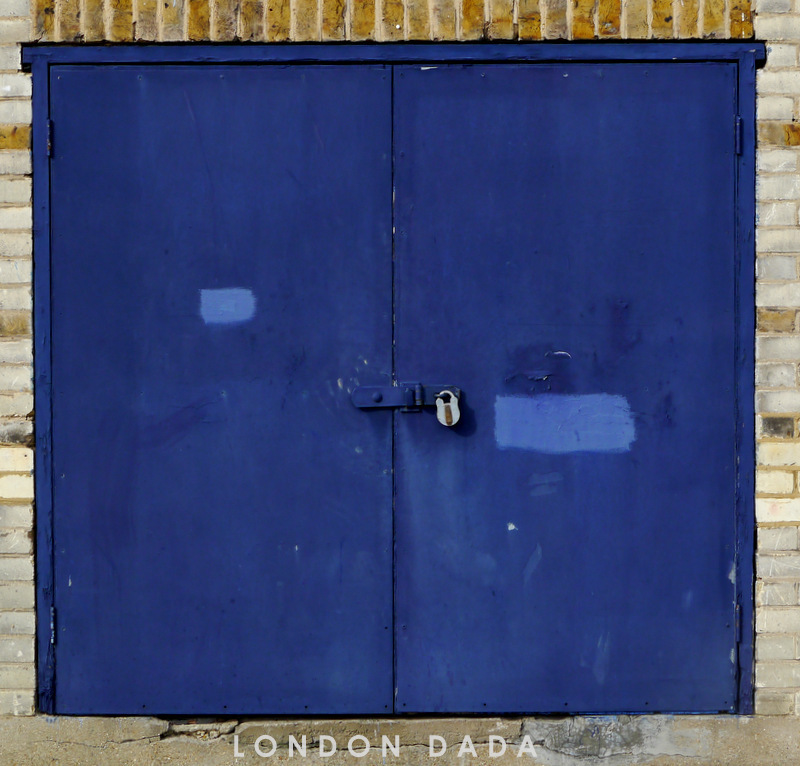 Alexandra Palace, Muswell Hill London N.
As London Dada has been highlighting over the past 9 years, Britain is a highly discriminatory employment fascist state in job opportunity lockdown. While only 1% of the adult population and 7% of graduates have attended private fee-paying schools, on average well over half of top jobs in Banking & Finance, Media, Law, PLCs and Politics in the UK are filled by this Oxbridge etc-educated elite, creating and maintaining a time-honoured and deeply-entrenched network of cronyism and privilege that controls all the serious power and wields the major influence in this, the most class-divided nation on earth. Result – selective promotion from a small talent pool that’s based on elitism rather than merit, leading inexorably to bad, out-of-touch governance and management, and more importantly fair opportunity denied to millions of gifted young people whose talents are tragically wasted – many forced to spend an entire lifetime languishing in unsuitable low skill work, trapped under bomb-proof glass ceilings rigorously enforced and gate-keepered by all the major institutions and corporations. Totally outrageous and morally indefensible in any society claimed by its government to be democratic and civilized. ” We straight white Oxbridge-educated males who rule Britain are used to periodic rumblings of discontent from below. Now the transvestite artist Grayson Perry, writing in the New Statesman magazine, has savaged what he calls “Default Man”: “With their colourful textile phalluses hanging round their necks, they make up an overwhelming majority in government, in boardrooms and also in the media.” The writer Caitlin Moran half-jokes that she is the only working-class Briton with a newspaper column: “I have the entire quota.” Sample the FT’s top stories for a week You select the topic, we deliver the news. Indeed, the Social Mobility and Child Poverty Commission notes that 59 per cent of the British cabinet, three-quarters of senior judges, half of diplomats, etc, went to Oxbridge. The typical chief executive attended Oxbridge or Harvard, says business data firm Qlik. Few of these people are women. Even those of us who groom the lower slopes of the establishment – pundits, MPs, and so forth – tend to be Oxbridge men. My caste produces the opinions that most British people are expected to swallow. However, the one topic we seldom discuss honestly is our own rule. So let me try to describe how it looks from up here. We didn’t have to work very hard to get here. Luckily, the British establishment doesn’t demand workaholism, except for a few months around exams. The gentleman dilettante is still honored (see David Cameron). Our competition to get into Oxbridge was mostly limited to other white upper-middle-class males. After that, we began recruiting each other. When I applied to the FT 20 years ago, I think I was interviewed only by white Oxbridge men, all of them straight (except for one who soon afterwards came out of the closet). My start in journalism was unimpressive but then I didn’t have much to prove: I already was a white Oxbridge male. Aged 28, I became a columnist at another British newspaper. Perry quotes the American writer John Scalzi, who “thought that being a straight white male was like playing the computer game called Life with the difficulty setting on ‘Easy’”. About the same time as I began work, a black friend started out at another newspaper. His news editor had little confidence in him, and my friend never got the career he wanted. Perhaps I now have his job. We Oxbridge males help each other throughout life. Perry remarks that nobody talks about the “white middle-class community”. But it exists. Once, in a faraway land, I visited the British ambassador. Lo and behold, he was a straight white Oxbridge-educated male! He was like a friend I’d never met. He ended up giving me a briefing in his swimming pool. We Oxbridge males display exemplary class solidarity. Our basic ideology is: trust in the system. After all, the system is run by chaps like me. I did my degree two minutes’ walk from Cameron’s college, and five minutes from the opposition leader Ed Miliband’s. I don’t identify with everyone in the establishment, because of intra-caste divides that are invisible to outsiders (for instance, Cameron is far posher than me) but the current popular rage at politicians bewilders me. Like the communist rulers in 1989, we white Oxbridge males cannot defend our dominance with arguments. Most of us know we didn’t get here through individual brilliance.